I have come to appreciate a good baby shower game. If done well, it’s a great way to get all your guests involved. Not to mention, a nice transition from the eating portion to the gift opening portion of the shower. I knew for this baby shower that I wanted to get my friend’s husband involved because he is such a character. 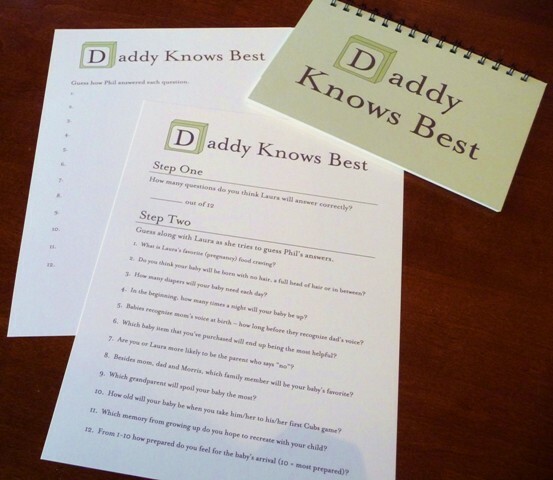 I learned of a game called Daddy Knows Best, where you ask the father-to-be a series of questions, then have the mother-to-be try to guess his answers at the shower. The game is simple, but I wanted to create an experience that would be fun for everyone. I made game cards for each guest with two sections – first they would predict how many of Daddy’s answers Mom would guess correctly; second they read through the list of 12 questions I had asked Daddy and tried to guess his answers for themselves. Once guests had filled out their cards, it was time for Mom to play the game. 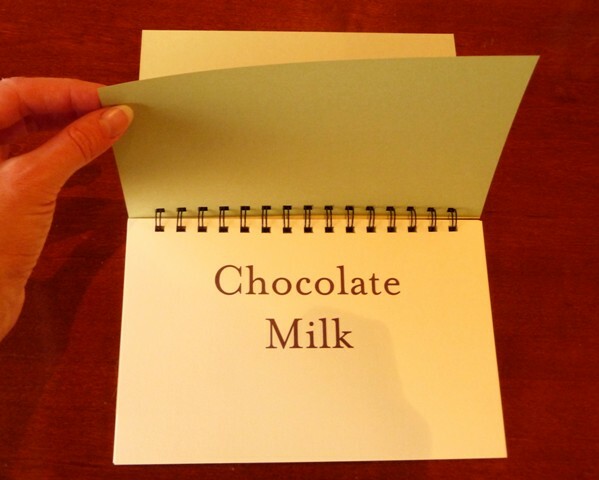 A spiral bound book made using our new Zutter machine contained all the questions and Daddy’s answers. It was much more interesting for me to flip through book than to have read the answers off a page, and my friend loved being able to keep the book once we were finished. To determine a winner, guests kept track of how many questions they answered correctly. The guest with the most correct answers would win, and in our case of a tie we then compared the guests’ predictions of how many questions Mom would get correct to how many she actually answered right. A special thank you to my co-worker Ann, who provided loads of baby shower inspiration and constructed this adorable spiral bound game book. Darling idea! What questions did you ask Daddy? – Which grandparent will spoil the baby the most? – Which memory from growing up do you hope to recreate with your child? – Are you or mom more likely to be the parent who says “no”? – On a scale of 1-10, how prepared do you feel for baby’s arrival? Hi there – I love this idea! It will be perfect for my sister-in-law’s shower next week. Is there any way you would share your document with the questions on it with me? I can change around the questions, but I am having a hard time trying to re-create your format. I too, would love to read what the questions are. I can totally make my own sheet but the questions are hard to think of. Thanks a ton! Could you please e-mail me the ?’s as well! Here are the questions we used, but the possibilities are endless! 1. What is Laura’s favorite (pregnancy) food craving? 2. Do you think your baby will be born with no hair, a full head of hair or in between? 3. How many diapers will your baby need each day? 4. In the beginning, how many times a night will your baby be up? 5. Babies recognize mom’s voice at birth – how long before they recognize dad’s voice? 6. Which baby item that you’ve purchased will end up being the most helpful? 7. Are you or Laura more likely to be the parent who says “no”? 8. Besides mom, dad and Morris (the dog), which family member will be your baby’s favorite? 9. Which grandparent will spoil your baby the most? 10. How old will your baby be when you take him/her to his/her first Cubs game? 11. Which memory from growing up do you hope to recreate with your child? 12. From 1-10 how prepared do you feel for the baby’s arrival (10 = most prepared)? Does anyone know any youtube videos of dads actually answering these questions out loud? I found one, but now I can’t find my link!! My son and his wife are having their first baby. I am having a ‘man’ shower for them Saturday. I am so doing this game!!! Now, to ask him the questions without him being suspicious…….I want to keep it a secret til then. I want to do this for a couple’s baby shower but I’m going to use white boards and have the couple answer the question together to see if they get matching answers. Great idea! What is the name of the font? I love it. 3.	Who will be getting up in the middle of the night to feed the baby? 9. Which of you two will be the disciplinarian and which will be the softie? 13. Whats been the funnest part of being pregnant? 14. What was your favorite childhood toy? 15. Whats been the most stressful part of being pregnant? 16. According to the nursery rhyme, little girls are made of what? 17. If you could take your baby on a trip anywhere in the world where would u go? 18. What was the first word that came out of your mouth when you found out Vanessa was pregnant? 19. What is one word that would describe vanessas mood while being pregnant? 20. What are you most looking forward to about being a dad? 21. What holiday are you looking to celebrate with your baby most? 22. If your daughter could grow up to become any profession in the world, what would you like? 23. What is one wish for your baby? 24. What are you most scared of? 25.	what was your favorite movie or tv show when you were a child? Thank you for the great idea for my son! This is an awesome idea– definitely going to use it for a shower I am planning in January. Thanks so much for sharing and for everyone’s additional comments!